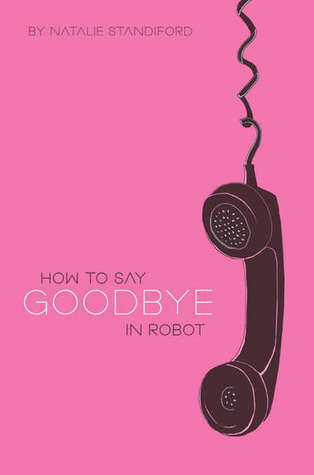 (#16) Book Review: How to Say Goodbye in Robot by Natalie Standiford – Hey, Library Girl! When Bea moves to a new town, she’s surprised to find herself becoming friends with Jonah, a boy who has been dubbed “Ghost Boy” since middle school by all of his classmates. Pale, withdrawn, and closed off to the entire world, Jonah presents an interesting challenge to Bea, and she becomes drawn to him. Together, the two of them create an unlikely friendship that runs deep but never quite swerves into a romance. As Jonah’s fragile world begins to break, Bea wonders if she can help him recover himself. Certainly one of the quirkier novels to grace the YA shelves, Standiford’s beautiful, haunting novel about a complicated friendship and the pangs of growing up is pretty captivating. Bea has moved around for much of her life and has learned not to make connections to people. When she starts her senior year at a new school and meets Jonah, the king of not making connections, she feels oddly drawn to him. The two of them begin a relationship that many reviewers have tried to classify as a platonic friendship, but that doesn’t quite do them justice. Jonah and Bea are drawn to each other, and they find solace in each other’s presence. Bea seems, at times, to want more than friendship from Jonah, but he’s so lost in his own world that he seems incapable of meeting her needs. It may be that Jonah is asexual, but that concept is never really explored. At any rate, his relationship with Bea is not romantic, but it’s not just friendship, either, as both of them seem to want to keep the other all to themselves. It’s messy and complex, and very, very real. What Standiford manages to do very well is remarkable. In addition to creating weird characters who also seem very real, she keeps a plot that seems preposterous at times from veering off into the ridiculous. Nothing that happens seems out of the realm of possibility, even when Jonah and Bea act a little on the absurd side. This was my one worry when I was reading the book, and I was happy to find that Standiford straddles the line perfectly. This is not a happy book, despite the pink cover. The title tells you that this will be a book with at least some goodbyes, and it is. At times funny and at times very, very sad, this is a book that stays with you after you finish the last page. Highly, highly recommended, y’all. How to Say Goodbye in Robot by Natalie Standiford. Scholastic Press, 2009. Library Copy.